No good conference ends when the caterers pack up the food and attendees board their flights home. At truly great events, the webinars, panel discussions, workshops, and swag are only the beginning. For conferences like SUMtech, the real magic happens after you return home and begin implementing what you’ve learned. That’s when all the knowledge and renewed motivation really pay off. We originally created SUMtech to fill a gap I identified in New York City’s accounting scene. We wanted to go beyond the tired seminars and stale networking events that dominated the industry to educate entrepreneurs, accountants, and business leaders on big-picture issues impacting business growth. To host the best (un)accounting conference east of the Mississippi, we funneled the brightest minds in business right into our own backyard for four days of insightful webinars and energizing live events. Our six webinar and live event speakerseducated attendees on leveraging new technologies, creating more efficient workflows, developing stronger partnerships, becoming more effective managers, and telling their stories. Joshua Johnson, vice president at Influence & Co., offered insights on transforming a business through authentic thought leadership content. Without a doubt, Johnson and his fellow panelists were instrumental in making the event a success. Samantha Stephens, chef and founder at OatMeals, shared her perspective on turning passion into profits. Danny Mizrahi, CEO of Contango IT, gave attendees valuable advice on building a successful company culture (and offered a few book suggestions, too). And small business expert Freda L. Thomas leveraged her more than 20 years of experience to help attendees learn how to set practical goals and effectively plan for the future. The event’s emergent theme was the idea of “quantifying your vision,” compelling attendees to find ways to measure how closely their work was aligning with their mission. However, that doesn’t diminish the qualitative metric that’s most important for any entrepreneur. I concluded a panel discussion by reflecting on the fact that every entrepreneur must, first and foremost, love what he’s doing. Happiness is a vital part of being a successful business owner. We’re so glad these experts were willing to take the time to share their knowledge to further help each attendee find success, and we’re equally grateful for our sponsors. We would never have been able to make our vision a reality without the generous support of Ed Kless from Sage, LDI Color ToolBox, Influence & Co.,, Contango IT, OatMeals, and Freda L. Thomas. We’d like to offer special thanks to Avalara, a company that’s been with us since the beginning. 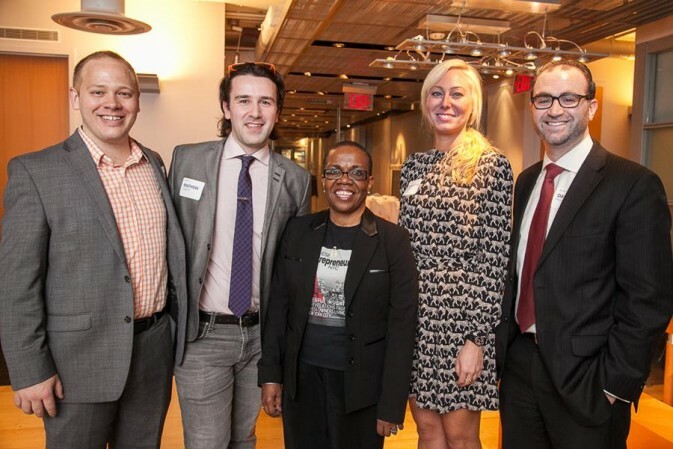 SUM Innovation was selected as one of Avalara’s Top-Performing Partners for 2014, and its support of this event was invaluable. After all was said and done, 200 attendees walked away from SUMtech 2015 armed with the inspiration and information to increase their efficiency, serve their clients better, and achieve rapid business growth. But if you weren’t one of them, you don’t have to miss out on all the insights and education you need to grow your business. Subscribe to our blog to get innovative new ideas delivered straight to your inbox and be the first to hear about next year’s event. Dancer-turned-accountant Mathew Heggem is CEO of SUM Innovation, a company that assesses, designs, implements, and manages accounting solutions for fast-growth startups, international businesses, established and growing businesses, and nonprofits across the U.S. Mathew is also the founder of the #SUMTech Summit and the #AccTech Cooperative meetup group in New York City, which explores the intersection between accounting, technology, and entrepreneurship.